The word epic is overused. It’s become watered down over the years. And most people don’t appreciate what it means. These 7 web maps define epic. They leave an impact on the reader. And they will leave you in a state of awe. Take a look at our growing list of best maps online. Nine Point Five puts a 3D touch to the Richter scale. The bars shoot out like spikes on a porcupine. Each one depicts the scale of an earthquake. The larger the magnitude, the larger the spike. Nine Point Five uses WebGL 3D visualization to explore earthquakes over the past 30 years. In this 3D visualization, you can really see how the majority of earthquakes are along plate tectonics. Jaw, meet floor. Esri’s high-tech Portland 3D City viewer comes loaded with textured 3D buildings and trees. Not only can you pan around in 3D, but you can change the sun direction for different times of the year. This web platform is any city planner’s dream. Portland is one of the most geo-advanced cities in the world. It truly flexes its GIS muscles with this detailed Esri’s CityEngine platform. It’s state-of-the-art technology that any city can benefit from. These mesmerizing wind vector maps from Earth Null School and Ventusky are the thunder and lightning tandem of weather maps. What’s really astonishing is how the data is being pulled in real-time. It’s so powerful because it shows weather patterns for the next couple hours. 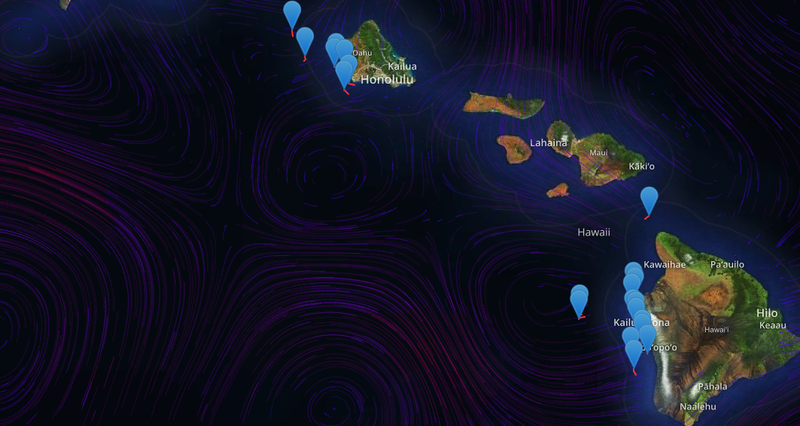 But it’s the small touches that make these web maps epic like the animated wind vectors and temperature. Majestic from start to finish. The winds are strong in this one. Show Me the Way puts the colossal project known as OpenStreetMap into a whole new light. Its head-spinning panning action interactively shows you the collaborative efforts of OpenStreetMap. At warp speed, this map takes you on a journey. Collaborators from around world digitize our changing planet in front of your very own eyes. ArcGIS Online (AGOL) web scenes enable 3D viewing in any type of web browser. Over the years, AGOL has really pushed online mapping to the next level. Finding Nemo would’ve been pretty lame with one of these SmartMine Trackers. The Whale Tracker web map lets you stalk different types of whales as they migrate around the Hawaiian Islands. With the goal to study whale movements in the Pacific Ocean, this map is a powerful tool with their known positions. Leaflet and Mapbox help power these maps. NOAA tracks the weather. 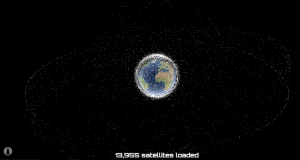 Each satellite orbits around the Earth in a predictable trajectory. Filter between junk and non-junk and country of origin. Richie Carmichael has more gems in his portfolio like this Hydro Hierarchy, Submarine Cable and even a flight simulator. It’s almost as if Flight Radar 24 turns your computer into an air traffic control system. Minus the control of course. Over the years, Flight Radar 24 has played an important role in tracking down missing airplanes because of its near real-time aircraft positioning. This is why it’s been used to learn about aircraft’s last known positions like MH370. Flight Radar 24 uses Cesium for its 3D cockpit view. 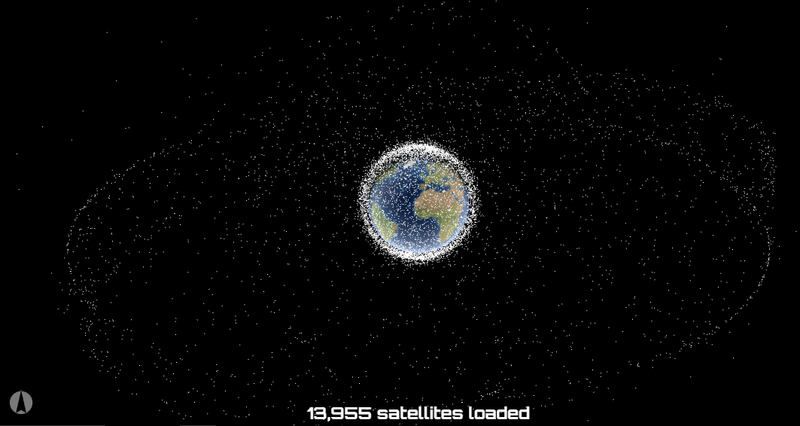 And it’s a neat way to see just how many airplanes are in air space. If you like the water more than the skies, then set sail with the Marine Traffic web map. Using Automatic Identification System (AIS) vessel tracking, this web map locates ships by type, capacity and last-known position. Further to this, the density maps show which routes sailors use most. This helps sailors get an idea of just how much marine traffic sails by at a given time. For example, Flight Radar 24 sheds new light on our very busy skies. In the case of Ventusky, it forecasts the weather in a beautiful way. And Portland’s 3D City reveals building height for city planners. This is certainly not an exhaustive list but these have made appearances in GIS Geography in the past. If you think we should add other web maps to the list, show me what you got. As seen fit, this list will evolve over time. Which web maps have blown your mind? Let us know with a comment below. You want more mouth-watering maps? Here are some more web mapping resources to help fill your appetite.